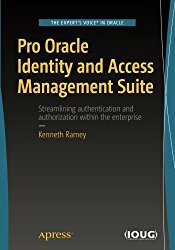 This book presents a process-based approach to implementing Oracle’s Identity and Access Management Suite. Learn everything from basic installation through to advanced topics such as leveraging Oracle Virtual Directory and Identity Federation. Also covered is integrating with applications such as Oracle E-Business Suite and WebCenter Content. Pro Oracle Identity and Access Management Suite provides real world implementation examples that make up a valuable resource as you plan and implement the product stack in your own environment. The book and the examples are also useful post-installation as your enterprise begins to explore the capabilities that Identity Management Suite provides.Implementing an identity management system can be a daunting project. There are many aspects that must be considered to ensure the highest availability and high integration value to the enterprise business units. Pro Oracle Identity and Access Management Suite imparts the information needed to leverage Oracle’s Identity and Access Management suite and provide the level of service your organization demands. Show results to leadership by learning from example how to integrate cross-domain authentication using identity federation, how to allow user self-service capabilities across multiple directories with Virtual Directory, and how to perform the many other functions provided by Oracle Identity and Access Management Suite.Presents an example-based installation and configuration of the entire Oracle Identity and Access Management Suite, including high-availability and performance-tuning concepts.Demonstrates Identity Federation, Virtual Directory, Fusion Middleware Integration, and Integration with Oracle Access Manager.Introduces concepts such as Split Profiles for Identity Manager, MultiFactor authentication with Oracle Adaptive Access Manager, and Self Service Portals.